Frank Miller has not aged particularly well. I don't mean that his classic works don't hold up; they're just as good as ever. I also don't mean physically; he looks about like someone his age should. What I mean, I guess, is that his mind hasn't stood the test of time. Much of what he's been involved in recently, from his dreadful directorial debut film (Frank Miller's The Spirit) to his pointless commentary on the Occupy Wall Street movement, makes it hard sometimes to remember that this is the man who's basically responsible for our modern characterizations of characters like Wolverine and frickin' Batman. In fact, Frank has that rare distinction of helping to create the classic, iconic iteration of a character (The Dark Knight Returns) and also turning him into a meme-worthy parody of his former self (All-Star Batman & Robin). Even weirder is that according to Miller, every Batman story he's written is meant to represent the same individual at different points in his career (as his tales typically take place outside mainstream continuity). Which means the aging Batman who was beating up mutants and implementing martial law against a Cold War backdrop during Ronald Reagan's administration is the same one laughing like a maniac while murdering cops and terrorizing a small child (and also proclaiming himself "The Goddamn Batman"). That's like Christopher Nolan saying the Batman in his films is meant to represent the early years of the same individual Adam West portrayed in the cheesy 1960s show. But the important thing is that Batman is dark, brooding, and tortured, as well as being a strict authoritarian figure, which is a characterization that persists to this day. DKR itself remains very popular, and is certainly required reading for anyone interested in comics. There's been merchandise before, including some PVC figurines and action figures from DC Direct, but at long last Mattel is giving us their rendition. 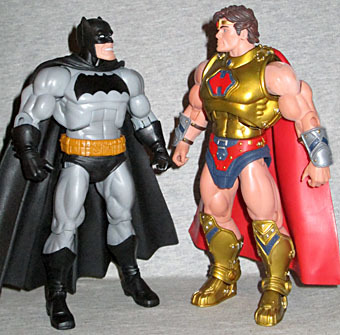 The defining feature of DKR Batman is that he's a beefy dude, so Mattel has cleverly used their Masters of the Universe Classics body to make Batman look properly filled out. It's a great solution: a well-articulated, muscley body that's generic enough to work for a multitude of characters. 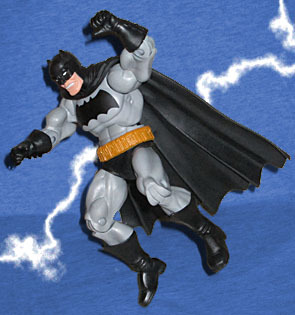 The head, forearms, and lower legs are new, and there's a new cape piece that wraps around his neck and a utility belt/​underpants combo for the waist. 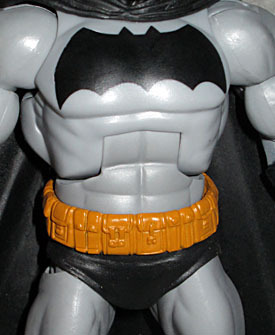 The chest piece may be new as well, since it seems to lack definition between the pectoral muscles in order to let the bat-symbol on his chest take center stage. It all works well, even though the new tooling is minimal (Mattel's official stance is that only the shoulders are shared, but that's bullcrap). 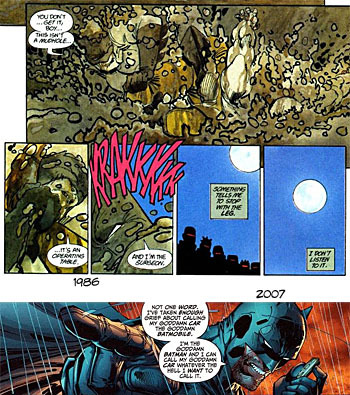 He's a bit too ripped to be an exact DKR match, as Miller's Batman was well-built, but a tad doughy (he was an old man, after all). The new sculpted bits are great. The head is nice and squat with stubby little bat ears, with a proper squint and gritted teeth. 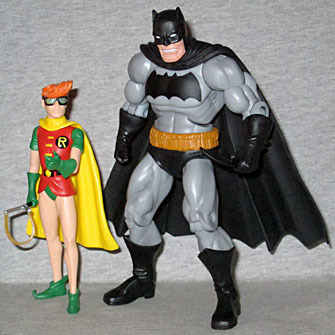 The gloves, boots and underpants all do their part admirably, and the super-pouchy utility belt is right out of the comics. The cape is nice, but a bit stiff, which makes it difficult to get Bruce into a nice DKR-style hunched pose due to the cape flaring out too far in back for him to stand. The paint is simple but effective. The giant bat-symbol on his chest, a DKR trademark, is well done and crisp. There's not a lot of paint to mess up, but what is here is done well. The belt and the face are the only pieces that aren't black or gray, and they're both clean and unslopped. There's a slight drybrushing on the limbs to create shadows, but you have to look closely to see it. One of the biggest annoyances with DC Direct's DKR Batman was a very tacky, glossy cape that was a dust magnet, so Matty has the edge here. They've also got the edge on articulation. We'd chalk that up to the DCD figure being much older, but they honestly haven't made a lot of strides in the interim years (and in some cases, they've gone backwards). Matty's Batty gets the standard MOTUC articulation: balljointed neck, peg/hinge shoulders, peg biceps, hinge elbows, peg wrists, torso hinge, balljointed hips, peg thighs, hinge knees, peg boot tops and hinge elbows. It's a good setup, but as I mentioned his cape makes it difficult (but not impossible) to get him as hunched as you might like. And seriously, he likes to hunch. His only accessory is a batarang in the DKR style, which means its basically a half moon serrated on one side. It's not bad, other than the giant "CHINA" stamp embossed on it, aka the ol' accessory ruiner. It's not much, but then this is a much larger figure than the others in the line, and as pathetic as it is we're actually lucky to get a batarang with Batman these days. SERIOUSLY, BATMAN SHOULD ALWAYS COME WITH A BATARANG. 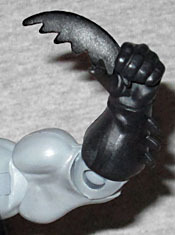 Remember when Mattel gave us a Batman with seven batarangs? Those were the days. 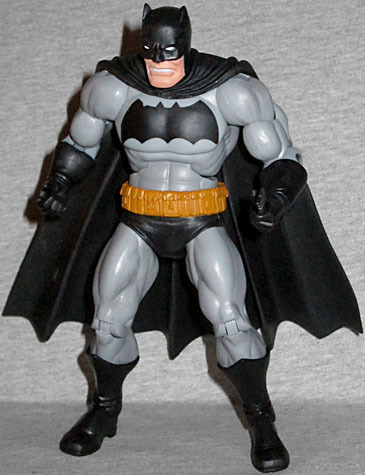 This is a really well done Batman figure based on possibly the most influential Batman story ever. So you should probably pick it up. Plus, if you're one of those wacky MOTUC fans, you now have a Batman that can fit in with that universe, for whatever that's worth. Though don't be surprised if Randor institutes martial law and Teela becomes an aging, overweight madam. That's just how Frank Miller (t)rolls.